First, I’d like to send out my thoughts and prayers to everyone encountering Hurricane Sandy. As a girl from South Texas, I understand the scariness and uncertainty of hurricane season, so my heart goes out to them-especially my ENTIRE family in New York. I found yet another local place to buy grass-fed beef and naturally-raised pork, called Northstar Ranch. We came across this beauty when perusing around the Dallas Farmer’s Market-which is at least three times as bigger than the Denton Community Market (see that post here). My mission was to find Rehoboth Ranch since a fellow blogger, Alta, informed me they were there year-round (and the trip out there was intense). We happened to walk past the guy at Northstar and grabbed a flyer that has his pricing. They had individual cuts of meats along with packaged deals if wanting to buy in bulk. But after much debate, we decided to go with one of his package deals. We figured that would last us longer than getting a few cuts here and there. The multi-meat pack was out so we went with solid beef for $135. 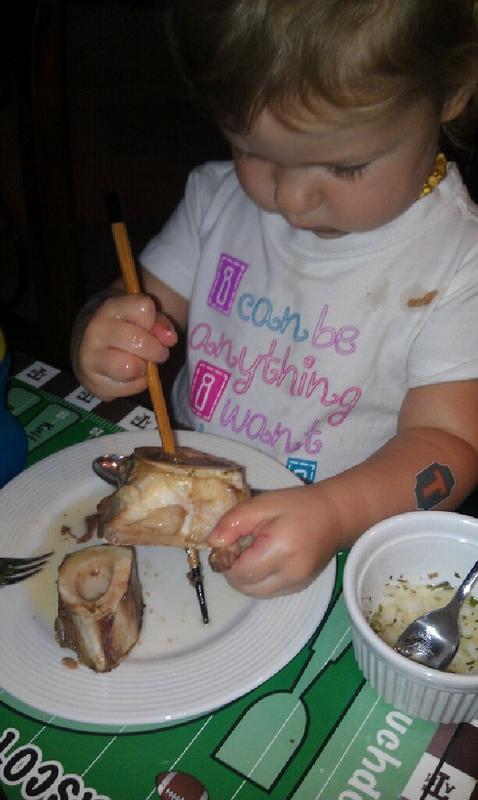 I also got brave and asked for some marrow bones, since I heard they were delicious AND had huge healing benefits. I followed Mark Sisson‘s approach to cooking them and I’m pretty sure Emma ate about 3/4 of them for breakfast one morning. Seriously, that kid will eat anything! The part I’m most excited about is eventually buying our own cow (or splitting it with a couple of people since they are pricey, around the tune of $1,200!). I figure it’s cheaper in the long run and you can customize your cuts with the butcher in the process. You can’t beat having a farmer who’s 26 miles away, (in Krum, TX) who stands by his cows. Brian did give us a head’s up about getting to know your butcher, too. He has one that he trusts and would recommend to us once we do decide to get a whole cow, which luckily can be bought year-round. Brian let us know that some butcher’s will process both grass-fed AND grain-fed cows at the same time, so you may not go home with the right meat…like what happened to Brian. I’m pretty sure you can’t fool a rancher once they know the taste of their own grass-fed cows. Shame on you, butcher! 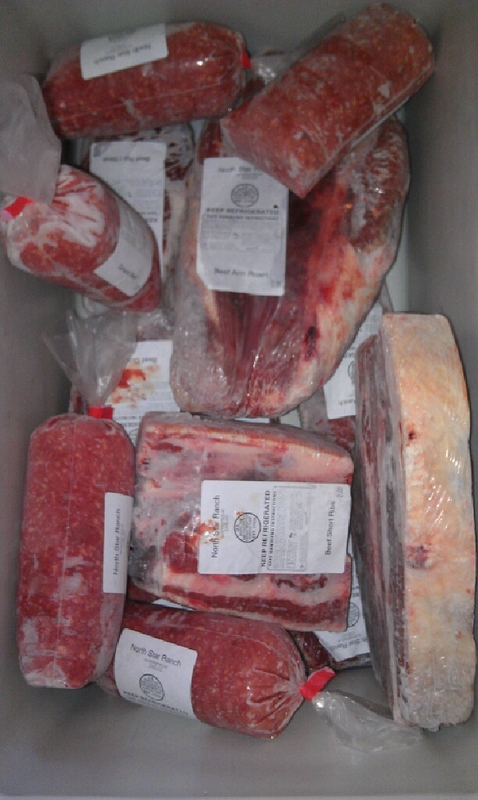 So for now, we will enjoy our somewhat-full freezer of grass-fed AND grass-finished beef from a local source. Just gotta work on putting a whole cow into the budget so we can be stocked for the upcoming year. Wouldn’t that be nice to run to the freezer for dinner instead of the grocery store every.single.day? I think so. Do you have a local source for meat, eggs, dairy, etc? Do you raise your own, when possible? 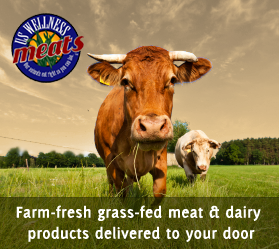 If you need some resources or just a place to start, check out U.S. Wellness Meats and Local Harvest to find what’s close to you or order online. After watching Genetic Roulette, my mom is disgusted and ready to gut her pantry, so hopefully these sites will get her going. Lovvve it! 🙂 I just made an order with Rehoboth to pick up at the market this weekend- eggs and lamb shank. They were out of the other stuff I wanted. Makin’ progress on buying local though. Oh, thanks for pointing me in the right direction as far as local grass fed meats go! I guess we’ll have to swing by the market now to check it out. Have been mostly paleo for the last year but am now looking into getting better quality meats, or at least bones to make bone broth. Thanks! You’re welcome! I love having access to grass-fed and pasture raised meats. Paleo has been a fun/healthy journey for our whole family 🙂 Thanks for stopping by!